While everyone was anticipating a showdown between Alberto Contador and his Saxo Bank-Tinkoff Bank team and Chris Froome and Team Sky (and it may yet transpire), Juan Antonio Cobo and Movistar have been rather overlooked. 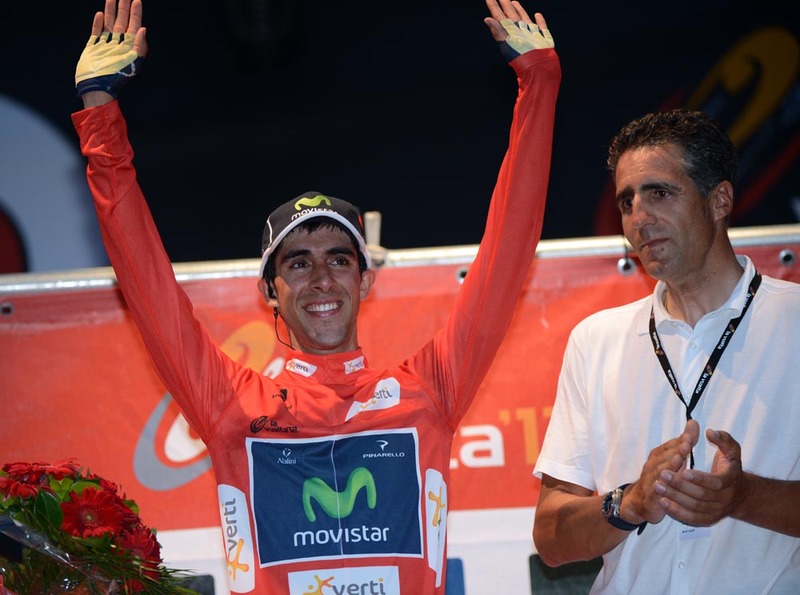 None of which stopped Movistar’s Jonathan Castroviejo pulling on the first leader’s red jersey of the 2012 Vuelta. Castroviejo rode the Eneco Tour and was a close 13th in the final stage and finished 10th overall at 55 seconds. Castroviejo skipped the Tour de France, is fresh, in form and is no mug, but he’s no mountain climber either. Cobo has a solid team around him. In the post-Tour de France excitement about Team Sky and Froome, in the blizzard of Contador comeback hype, the winner of the 2011 Vuelta, Cobo, had been overlooked by most outside of Spain. After all, the 31-year-old had ridden an anoymous Tour (finishing 30th overall, over an hour off Bradley Wiggins) and barely showed in a break throughout the whole race. 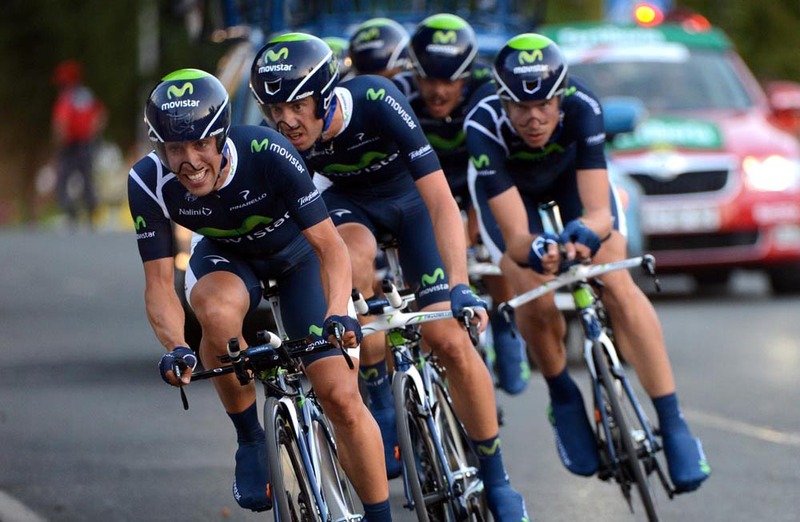 In the space of 10 miles, the Movistar team reminded everyone that he and they shouldn’t be written off just yet. Furthermore, the presence in the Movistar team of Alejandro Valverde and talented young Colombian Nairo Quintana suggests that we Brits (at least) might have been blinded by Tour and Olympic euphoria. But we shouldn’t get carried away, even if Movistar managed to win the stage by a whopping 10 seconds, Rabobank (with Robert Gesink), Omega Pharma and BMC were tied on the same time in second and the gaps among the top teams weren’t exactly gargantuan. 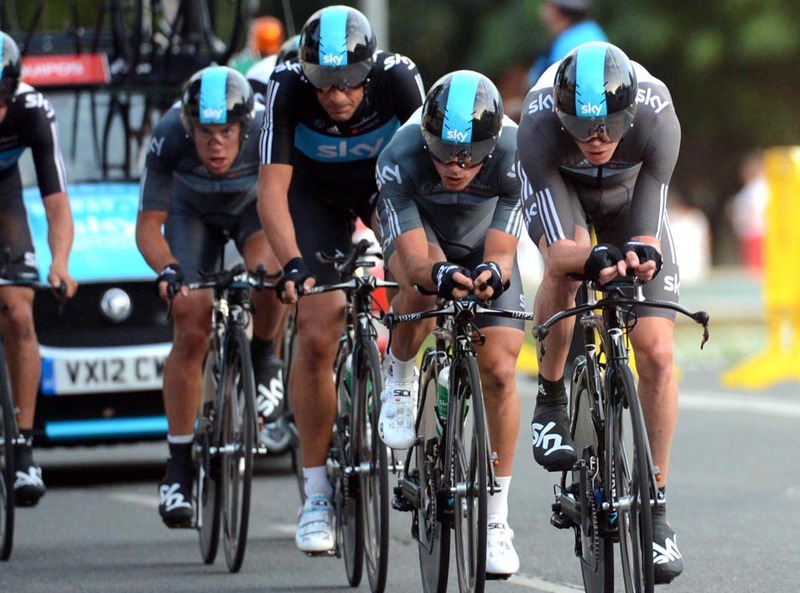 If we examine the relative performances of Froome’s Sky cohort and compare them to the Saxo Bank-Tinkoff Bank team, Sky put two seconds into Saxo Bank and finished the stage with more riders. While Contador was doing long turns and finished by leading his depleted team over the line in the Pamplona bullring, you rather suspect that Saxo Tinkoff team boss Bjarne Riis would have been secretly pleased to only have lost two seconds to Froome and his strong Sky team. And what else can we divine from the 20 minutes of racing around the city streets of Pamplona? BMC, Rabobank and Omega Pharma all looked like they were at the Vuelta with a purpose, Garmin were looking good until they crashed on a roundabout, losing three riders and all rhythm, dealing Andrew Talansky’s GC aspirations an early dent. The Katusha team managed to hold up their end and the overall classification plans of Joaquim Rodriguez. The Russian team might have finished eighth and lost 14 seconds to Movistar, but it was hardly a disaster on an essentially flat course traced around the streets of Pamplona. But it was still only 16.5km and with mountains galore this year, it’s unlikley that the handfuls of seconds won and lost here will have much of a bearing on the final outcome in Madrid in three weeks time. But it didn’t half whet the appetite.